KUALA LUMPUR —� Malaysia� ranked 12th among the countries and territories investing in� Vietnam� in 2018 with total registered capital hitting US$435.54 million, according to the� Vietnamese trade office in� Malaysia. 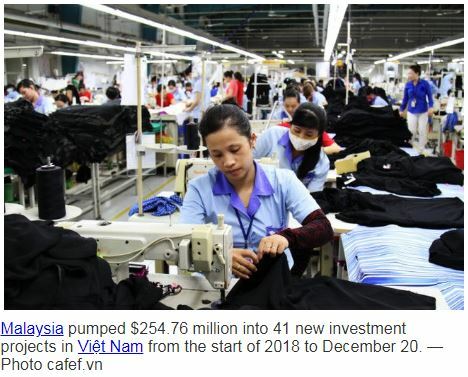 The country pumped $254.76 million into 41 new investment projects in� Vietnam� from the start of 2018 to December 20, while its investors added $27.47 million in total to their capital at 13 existing projects. Malaysian investors also spent $153.31 million buying shares in� Vietnamese companies.� Malaysia’s accumulated investment in� Vietnam� as of December 20 reached nearly $12.48 billion in 586 projects, ranking 8th among 129 economies investing in the country. Two-way trade value between� Vietnam� and� Malaysia� last year expanded more than 14 per cent on a yearly basis to nearly $11.5 billion.